In the summer of 2010, 20th Century Fox announced that it was casting three lead child roles in Cameron Crowe’s new movie We Bought a Zoo via online video submissions. Auditioners had very few requirements, besides age; children of all backgrounds who didn’t have agents were encouraged to film themselves reading a few pages of lines and then submit their audition to 20th Century Fox via YouTube. In a time when Hollywood was increasingly depending on household names to help market films, it was an unusual move. However, crowdsourcing as a marketing tool had taken off and Hollywood was ready to test its box-office impact. Merriam-Webster defines crowdsourcing as “the practice of obtaining needed services, ideas, or content by soliciting contributions from a large group of people and especially from the online community rather than from traditional employees or suppliers.” As a marketing tool, the benefits are often two-fold: creative costs are lowered by getting free or relatively cheap content, and it creates a buzz about the product before it even goes into production. In the case of We Bought a Zoo, the producers ultimately chose actors who already had established careers and even high-profile names; however, the crowdsourcing tactic put the film on the radar of adults with young children, a group that overlaps with the demographic with the highest movie attendance rate — adults ages 25-39, according to the MPAA. Budweiser probably isn’t saving much money in the creative department by getting fans to name the new Clydesdales, but the company is certainly fostering brand engagement in a week ramping up to a Super Bowl that is bound to have one of the highest rates of interactive marketing we have seen to date. While crowdsourced marketing may be reaching its saturation point, its cousin “crowdfunding” has had its best year to date, when measured by the success of websites such as Kickstarter and Indiegogo. 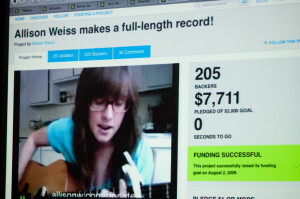 Businesses or individuals submit their projects to crowdfunding sites, and distribute their individual page to followers and friends as a means of fundraising. Last year, 2,241,475 people pledged a total of $319,786,629 USD to campaigns on the platform. That’s $606.76 per minute, a 221 percent increase from 2011. Backers successfully funded 18,109 projects, which cumulatively raked in $274,391,721. Once projects have a donor base, they can count on those donors becoming consumers. Who wouldn’t want to see the final product of something you contributed money to in its infancy? Looping consumers in early guarantees a captivated audience; it creates familiarity and sense of loyalty before product even comes out. Companies have been able to reduce overhead during production while simultaneously building a guaranteed consumer base. Game projects, for example, are some of the top grossers on Kickstarter. The donors that help fund game development are also incredibly likely to buy the game when it’s finished.